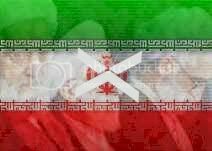 BEHESHTI: Rises from the grave! Ahmadinejad's biography shows a close relation with Beheshti, while organizing students and later when they stormed the U.S. Embassy. While all other student leaders involved in hostage taking joined the so called moderates and reformists, Ahmadinejad was probably the only one who stayed with conservatives. If you remember, when BEHESHTI got blown up along with another 70+ ayatollahs in majlis, Rafsanjani was the only one who left the place just in time! It seems as if Beheshti is reserected from the grave to take revenge on Rafi-Jani. and mighty well-done! Mind you if Beheshti was alive, neither Rafsanjani, nor Khamenei (ahmadinejad's new boss) would have held so much power to begin with. Seems like this is just the beginning, and they have it for Rafi-Jani. not that he doesn't deserve it. by the way if you can watch IRI tv without puking, they keep mentioning Beheshti, one after another! this guy was almost forgotton for all these years. and suddenly rised from the grave to restore the theocratic regime! This was the typical reaction of most Iranians a day after the first round of presidential elections in Iran, when they heard that the two candidates facing each other in the run-off were veteran politician Ayatollah Ali-Akbar Hashemi Rafsanjani and the little-known, ultra-conservative mayor of Tehran, Mahmoud Ahmadinejad. Last week�s surprise was all forgotten by the much bigger shock on Friday, when Ahmadinejad defeated the former President and iconic figure in the ruling theocracy in a landslide victory that consolidated power in the hands of the ruling Islamic clerics. With spotlights now trained on the small, bearded figure in a trademark dilapidated grey suit, Ahmadinejad�s murky past is causing deep anxiety in Iran and growing concern abroad over the new President�s policies and orientation. Born in the desert town of Garmsar, east of Tehran, in 1956, Ahmadinejad was the fourth child of a working class family with seven children. His father, who was a blacksmith, moved the family to Tehran when Ahmadinejad was barely a year old. He was brought up in the rough neighbourhoods of south Tehran, where a cocktail of poverty, frustration and xenophobia in the heydays of the Shah�s elitist regime provided fertile grounds for the rise of Islamic fundamentalism. After finishing high school, Ahmadinejad went to Elm-o Sanaat University in 1975 to study engineering. Soon the whirlwind of Islamic revolution led by Ayatollah Ruhollah Khomeini swept him from the classroom to the mosque and he joined a generation of firebrand Islamic fundamentalists dedicated to the cause of an Islamic world revolution. Student activists in Elm-o Sanaat University at the time of the Iranian revolution were dominated by ultra-conservative Islamic fundamentalists. Ahmadinejad soon became one of their leaders and founded the Islamic Students Association in that university after the fall of the Shah�s regime. In 1979, he became the representative of Elm-o Sanaat students in the Office for Strengthening of Unity Between Universities and Theological Seminaries, which later became known as the OSU. The OSU was set up by Ayatollah Mohammad Beheshti, who was at the time Khomeini�s top confidant and a key figure in the clerical leadership. Beheshti wanted the OSU to organise Islamist students to counter the rapidly rising influence of the opposition Mojahedin-e Khalq (MeK) among university students. The OSU played a central role in the seizure of the United States embassy in Tehran in November 1979. Members of the OSU central council, who included Ahmadinejad as well as Ibrahim Asgharzadeh, Mohsen (Mahmoud) Mirdamadi, Mohsen Kadivar, Mohsen Aghajari, and Abbas Abdi, were regularly received by Khomeini himself. According to other OSU officials, when the idea of storming the U.S. embassy in Tehran was raised in the OSU central committee by Mirdamadi and Abdi, Ahmadinejad suggested storming the Soviet embassy at the same time. A decade later, most OSU leaders re-grouped around Khatami but Ahmadinejad remained loyal to the ultra-conservatives. During the crackdown on universities in 1980, which Khomeini called the �Islamic Cultural Revolution�, Ahmadinejad and the OSU played a critical role in purging dissident lecturers and students many of whom were arrested and later executed. Universities remained closed for three years and Ahmadinejad joined the Revolutionary Guards. In the early 1980s, Ahmadinejad worked in the �Internal Security� department of the IRGC and earned notoriety as a ruthless interrogator and torturer. According to the state-run website Baztab, allies of outgoing President Mohammad Khatami have revealed that Ahmadinejad worked for some time as an executioner in the notorious Evin Prison, where thousands of political prisoners were executed in the bloody purges of the 1980s. In 1986, Ahmadinejad became a senior officer in the Special Brigade of the Revolutionary Guards and was stationed in Ramazan Garrison near Kermanshah in western Iran. Ramazan Garrison was the headquarters of the Revolutionary Guards� �extra-territorial operations�, a euphemism for terrorist attacks beyond Iran�s borders. In Kermanshah, Ahmadinejad became involved in the clerical regime�s terrorist operations abroad and led many �extra-territorial operations of the IRGC�. With the formation of the elite Qods (Jerusalem) Force of the IRGC, Ahmadinejad became one of its senior commanders. He was the mastermind of a series of assassinations in the Middle East and Europe, including the assassination of Iranian Kurdish leader Abdorrahman Qassemlou, who was shot dead by senior officers of the Revolutionary Guards in a Vienna flat in July 1989. Ahmadinejad was a key planner of the attack, according to sources in the Revolutionary Guards. Ahmadinejad served for four years as the governor of the towns of Maku and Khoy in northwestern Iran. In 1993, he was appointed by Minister of Islamic Culture and Guidance Ali Larijani, a fellow officer of the Revolutionary Guards, as his cultural adviser. Months later, he was appointed as the governor of the newly-created Ardebil Province. In 1997, the newly-installed Khatami administration removed Ahmadinejad from his post and he returned to Elm-o Sanaat University to teach, but his principal activity was to organize Ansar-e Hezbollah, a radical gang of violent Islamic vigilantes. Since becoming mayor of Tehran in April 2003, Ahmadinejad has been using his position to build up a strong network of radical Islamic fundamentalists organised as �Abadgaran-e Iran-e Islami� (literally, Developers of an Islamic Iran). Working in close conjunction with the Revolutionary Guard�s, Abadgaran was able to win the municipal elections in 2003 and the parliamentary election in 2004. They owed their victories as much to low turnouts and general disillusionment with the �moderate� faction of the regime as to their well-oiled political and military machinery. Abadgaran bills itself as a group of young neo-Islamic fundamentalists who want to revive the ideals and policies of the founder of the Islamic Republic, Ayatollah Khomeini. It was one of several ultra-conservative groups that were setup on the orders of Ayatollah Khamenei in order to defeat outgoing President Mohammad Khatami�s faction after the parliamentary elections in February 2000. Ahmadinejad�s record is typical of the men chosen by Khamenei�s entourage to put a new face on the clerical elite�s ultra-conservative identity. But beyond the shallow fa�ade, few doubt that the Islamic Republic under its new President will move with greater speed and determination along the path of radical policies that include more human rights abuses, continuing sponsorship of terrorism, and the drive to obtain nuclear weapons. Why do they all look like ugly monkeys? Posted: Sat Jun 25, 2005 8:07 pm Post subject: ugly as british monarchs! BECAUSE THEY ARE ALL LEFT OVERS OF BRITISH COLONIALIST ERA IN IRAN! A secret memorandum made available to Iran Terror by a source in the Iranian government sheds light on the mysterious past of Iran�s newly-elected ultra-conservative president. Information provided by this source has proven reliable in the past. The memorandum, from a senior official of Iran�s Ministry of Intelligence and Security (MOIS) to the minister, Hojjatol-Islam Ali Younessi, makes detailed references to some of the activities of President-elect Mahmoud Ahmadinejad during his 26-year career in the service of the Islamic Republic. Iran Terror was shown part of the memorandum, which described Ahmadinejad�s activities in the Islamic Revolutionary Committees in the wake of the rise of Ayatollah Ruhollah Khomeini to power in February 1979 and his work in the Internal Security Directorate of the Revolutionary Guards in the early 1980s. �Mr. 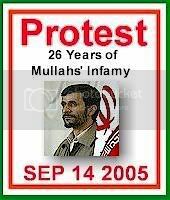 Ahmadinejad was one of the first volunteers to join the Islamic Revolutionary Committees after the Islamic Revolution and worked for some time in the Islamic Revolutionary Prosecutor�s Office based in Evin Prison. He took part in the implementation of the first waves of execution of the officials of the corrupt Pahlavi regime,� the memorandum noted. �Mr. Ahmadinejad worked in the internal security sector after June 1981 and was based in Evin Prison�, the internal document added. �He served with distinction in the crackdown on counter-revolutionary forces, particularly the Monafeqin�. Monafeqin, or hypocrites, is the clerical authorities� pejorative term for the opposition Mujahedin-e Khalq (MeK). Thousands of MeK members were executed in Iran in the early 1980s, according to Amnesty International and other human rights groups. The memorandum was drafted for the MOIS as part of a routine background check on all presidential candidates. Iranian law requires the watchdog Guardian Council to vet all candidates and the MOIS, as the official secret service, is required to provide background information on them. The minister, Ali Younessi, is known to have opposed the inclusion of the ultra-conservative mayor of Tehran in the shortlist of candidates approved by the Guardian Council, but the chairman of the Guardian Council, Ayatollah Ahmad Jannati, overruled Younessi�s objection. Ahmadinejad has for long been a prot�g� of the powerful ayatollah. Younessi was similarly opposed to the appointment of Ahmadinejad as the mayor of Tehran in 2003. The information in the memorandum is corroborated by a report on the Tehran-based website, Baztab, which quoted allies of outgoing President Mohammad Khatami as saying that Ahmadinejad �fired coup de grace shots at political prisoners after their execution,� for which his colleagues called him the �Terminator.� Baztab, which belongs to former Revolutionary Guards Chief Mohsen Rezai, denied the allegation. Exiled opposition leaders have said that Ahmadinejad has been involved in the execution of political prisoners in Iran and assassination of dissidents abroad, including the murder of a former minister and a prominent Kurdish leader. Ahmadinejad�s official biography is mum on the nature of his activities in the early 1980s. It is known that he went to fight in the Iran-Iraq war as a commander of the Revolutionary Guards in 1986, but the war began in 1980 and there is no mention of what he did between 1980 and the mid-1980s, the period which, according to the internal document and other accounts, he was involved in executions and assassinations. There has been no reaction by Ahmadinejad or his office to the widely reported allegations of his direct involvement in executions and terrorism. London, Jun. 29 - Iran Focus has learnt that the photograph of Iran�s newly-elected president, Mahmoud Ahmadinejad, holding the arm of a blindfolded American hostage on the premises of the United States embassy in Tehran was taken by an Associated Press photographer in November 1979. Prior to the first round of the presidential elections on June 17, Iran Focus was the first news service to reveal Ahmadinejad�s role in the seizure of the U.S. embassy in Tehran. The identity of Ahmadinejad in the photograph was revealed to Iran Focus by a source in Tehran, whose identity could not be revealed for fear of persecution. Soon after the Iranian Revolution in 1979, Ahmadinejad, who was studying in Tehran�s University of Science and Technology, became a member of the central council of the Office for Strengthening of Unity Between Universities and Theological Seminaries, the main pro-Khomeini student body. The OSU played a central role in the seizure of the United States embassy in Tehran in November 1979. Members of the OSU central council, who included Ahmadinejad as well as Ibrahim Asgharzadeh, Mohsen Mirdamadi, Mohsen Kadivar, Hashem Aghajari, and Abbas Abdi, were regularly received by Khomeini himself. Former OSU officials involved in the takeover of the U.S. embassy said Ahmadinejad was in charge of security during the occupation, a key role that put him in direct contact with the nascent security organizations of the clerical regime and the Islamic Revolutionary Guards, which he later joined. After the 444-day occupation of the U.S. embassy, Ahmadinejad joined the special forces of the Islamic Revolutionary Prosecutor�s Office, based in Evin Prison. The �Revolutionary Prosecutor� was Assadollah Lajevardi, who earned the nickname the Butcher of Evin after the execution of thousands of political dissidents in the 1980s. Defectors from the clerical regime�s security forces have revealed that Ahmadinejad led the firing squads that carried out many of the executions. He personally fired coup de grace shots at the heads of prisoners after their execution and became known as �Tir Khalas Zan� (literally, the Terminator). SAVANNAH, Ga. - A quarter-century after they were taken captive in Iran, five former American hostages say they got an unexpected reminder of their 444-day ordeal in the bearded face of Iran's new president-elect. Watching coverage of Iran's presidential election on television dredged up 25-year-old memories that prompted four of the former hostages to exchange e-mails. And those four realized they shared the same conclusion � the firm belief that President-elect Mahmoud Ahmadinejad had been one of their Iranian captors. "This is the guy. There's no question about it," said former hostage Chuck Scott, a retired Army colonel who lives in Jonesboro, Ga. "You could make him a blond and shave his whiskers, put him in a zoot suit and I'd still spot him." Scott and former hostages David Roeder, William J. Daugherty and Don A. Sharer told The Associated Press on Wednesday they have no doubt Ahmadinejad, 49, was one of the hostage-takers. A fifth ex-hostage, Kevin Hermening, said he reached the same conclusion after looking at photos. Not everyone agrees. Former hostage and retired Air Force Col. Thomas E. Schaefer said he doesn't recognize Ahmadinejad, by face or name, as one of his captors. Several former students among the hostage-takers also said Ahmadinejad did not participate. And a close aide to Ahmadinejad denied the president-elect took part in the seizure of the embassy or in holding Americans hostage. Militant students seized the U.S. Embassy in Tehran on Nov. 4, 1979, and held 52 Americans hostage for 444 days to protest Washington's refusal to hand over the U.S.-backed Shah Mohammad Reza Pahlavi for trial. The shah fled Iran earlier that year after he was overthrown by the Islamic Revolution. The aide, Meisan Rowhani, told the AP from Tehran that Ahmadinejad was asked during recent private meetings if he had a role in the hostage taking. Rowhani said he replied, "No. I believed that if we do that the world will swallow us." Scott and Roeder both said they were sure Ahmadinejad was present while they were interrogated. "I can absolutely guarantee you he was not only one of the hostage-takers, he was present at my personal interrogation," Roeder said in an interview from his home in Pinehurst, N.C.
Daugherty, who worked for the CIA in Iran and now lives in Savannah, said a man he's convinced was Ahmadinejad was among a group of ringleaders escorting a Vatican representative during a visit in the early days of the hostage crisis. "It's impossible to forget a guy like that," Daugherty said. "Clearly the way he acted, the fact he gave orders, that he was older, most certainly he was one of the ringleaders." Ahmadinejad, the hard-line mayor of Tehran, was declared winner Wednesday of Iran's presidential runoff election, defeating one of Iran's best-known statesmen, Ayatollah Hashemi Rafsanjani. The stunning upset put conservatives firmly in control of all branches of power in the Islamic Republic of Iran. Scott, Roeder, Daugherty and Sharer said they have been exchanging e-mails since seeing Ahmadinejad emerge as a serious contender in Iran's elections. "He was extremely cruel," said Sharer, of Bedford, Ind. "He's one of the hard-liners. So that tells you where their government's going to stand for the next four to five years." After seeing recent newspaper photos, Sharer said, "I don't have any doubts" that Ahmadinejad was a hostage-taker. A memory expert cautioned that people who discuss their recollections can influence one another in reinforcing false memories. Also, it's harder to identify from memory someone of a different race or ethnicity, said psychologist Elizabeth Loftus of the University of California, Irvine. "Twenty-five years is an awfully long time," Loftus said. "Of course we can't say this is false, but these things can lead people down the path of having a false memory." Schaefer, of Peoria, Ariz., didn't recognize Ahmadinejad and said allegations that he had been a hostage-taker don't concern him as much as knowing hard-liners are back in power in Iran. Scott gave a detailed account of the man he recalled as Ahmadinejad, saying he appeared to be a security chief among the hostage-takers. "He kind of stayed in the background most of the time," Scott said. "But he was in on some of the interrogations. And he was in on my interrogation at the time they were working me over." Scott also recalled an incident while he was held in the Evin prison in north Tehran in the summer of 1980. One of the guards, whom Scott called Akbar, would sometimes let Scott and Sharer out to walk the narrow, 20-foot hallway outside their cells, he said. One day, Scott said, the man he believes was Ahmadinejad saw them walking and chastised the guard. "He was the security chief, supposedly," Scott said. "When he found out Akbar had let us out of our cells at all, he chewed out Akbar. I speak Farsi. He said, `These guys are dogs they're pigs, they're animals. They don't deserve to be let out of their cells.'" Scott recalled responding to the man's stare by openly cursing his captor in Farsi. "He looked a little flustered like he didn't know what to do. He just walked out." Roeder said he's sure Ahmadinejad was present during one of his interrogations when the hostage-takers threatened to kidnap his son in the U.S. and "start sending pieces � toes and fingers of my son � to my wife." "It was almost like he was checking on the interrogation techniques they were using in a sort of adviser capacity," Roeder said. Hermening, of Mosinee, Wis., the youngest of the hostages, said that after he looked at photos and did research on the Internet, he came to the conclusion that Ahmadinejad was one of his questioners. Hermening had been Marine guard at the embassy, and he recalled the man he believes was Ahmadinejad asking him for the combination to a safe. "His English would have been fairly strong. I couldn't say that about all the guards," Hermening said. "I remember that he was certainly direct, threatening, very unfriendly." Rowhani, the aide to Ahmadinejad, said Ahmadinejad said during the recent meeting that he stopped opposing the embassy seizure after the revolution's leader, Ayatollah Ruhollah Khomeini, expressed support for it. But the president-elect said he never took part. "Definitely he was not among the students who took part in the seizure," said Abbas Abdi, the leader of the hostage-takers. Abdi has since become a leading supporter of reform and sharply opposed Ahmadinejad. "He was not part of us. He played no role in the seizure, let alone being responsible for security" for the students. Another of the hostage-takers, Bijan Abidi, said Ahmadinejad "was not involved. There was no one by that name among the students who took part in the U.S. Embassy seizure." Associated Press writers Aaron Beard in Raleigh, N.C., Amanda Keim in Phoenix, Deanna Wrenn in Indianapolis and Robert Imrie in Wausau, Wis., contributed to this report. He was extremely savage. According to one secret document in Farsi exposed by Baztab , he has been involved directly with over 1000 executins in Evin prison between 1980 to 1986. Posted: Wed Jun 29, 2005 11:12 pm Post subject: "it's impossible to forget a guy like that." Former hostage William J. Daugherty, a retired CIA staff officer, says "it's impossible to forget a guy like that." A photo has emerged which it is claimed links the President-elect of Iran, Mahmoud Ahmadinejad, with the taking of 60 American hostages during the US embassy siege in Tehran in 1979. A London-based Iranian news agency which opposes Mr Ahmadinejad is circulating the photograph, which it says was taken by the Associated Press news agency on the first day of the hostage crisis. In the picture, a man which the Iran Focus agency claims it has identified as Mr Ahmadinejad, is seen holding the arm of a blindfolded US hostage. The possible role of Mr Ahmadinejad in the embassy takeover, which lasted 444 days and remains a significant sore between America and Iran, came to light in the run-up to the presidential elections on June 17. Mr Ahmadinejad is known to have been member of the "Office for Strengthening of Unity Between Universities and Theological Seminaries" or the OSU, the main student group behind the takeover, but his precise role in the hostage-taking was unclear. Yesterday, in an article on the BBC website, the broadcaster John Simpson appeared to pour fuel on the controversy when he said he recalled meeting Mr Ahmadinejad after the hostage crisis and remembered seeing him in the grounds of the embassy. "When I read a profile of him in the English-language Tehran Times, I realised where I must have seen him: in the former American embassy in Tehran," writes Mr Simpson. "Ahmadinejad was a founder of the group of young activists who swarmed over the embassy wall and held the diplomats and embassy workers hostage for 444 days." And today, Mo Jazayeri, the executive editor of Iran Focus, the agency distributing the picture, was adamant that it showed Mr Ahmadinejad. He said: "We strongly believe it was 4 Nov 1979, the first day of the hosting taking in Tehran. The AP took these photos. There is also apparently footage which shows Ahmadinejad and several other hostage takers taking this hostage out of the compound and bringing him in front of the crowd which chants �Death to America.� It was a very horrific scene which was shown on television outside Iran worldwide." According to Michael Theodoulou, who covers Middle East affairs for The Times, the photograph, if genuine, could have a damaging effect on Mr Ahmadinejad's relationship with America, which is already expected to be fractious. "These images will really anger the Americans," he told Times Online. "Britain is never really aware of the impact the hostage crisis had on the American pysche. No other foreign crisis had the same effect. It really formed the image of Iran in America and is a real source of the continuing hostility between the two countries." 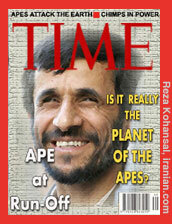 But the claims have been strongly denied by Mr Ahmadinejad's office, which says that the man in the image is not him. Other hostage-takers who were present at the embassy siege also say that the President-elect was not involved in the storming of the embassy. Ramita Navai, correspondent for The Times in Tehran, spoke to Abbas Abdi, one of the leading hostage takers, who has recently been released from prison, this morning. She said: "I spoke to Abbas Abdi today and he said that Ahmadinejad didn't storm the embassy. And he also said: 'Look, a lot of people came in and out of the embassy during the crisis. It went on for more than a year'." Ms Navai said that so many of the students involved in the hostage crisis went on to become politicians that there is no reason why Mr Ahmadinejad would disguise his role in the siege. A quarter-century after they were taken captive in Iran, five former American hostages say they got an unexpected reminder of their 444-day ordeal in the bearded face of Iran's new president-elect. New Iran Prez Took U.S. Hostages? Twenty-five years after they were taken captive in Iran, five former hostages say they got an unexpected reminder of their ordeal in the bearded face of Iran's new president-elect. "This is the guy," said retired Army colonel Chuck Scott. Twenty-five years after being taken hostage in Iran, five Americans believe Iran's president-elect was one of their captors. SAVANNAH, Ga. Five former American hostages held in Iran say the country's president-elect was one of their captors. Five Americans held hostage in the US Embassy in Iran in 1979 claim the country's President-elect Mahmoud Ahmadinejad was one of their captors. June 29, 2005: Iranian President Mohammad Khatami, right, smiles as Mullah's president-select Mahmoud Ahmadinejad, looks on during a meeting in Tehran. WASHINGTON (Reuters) - President George W. Bush said on Thursday he wanted answers on whether Iranian President-elect Mahmoud Ahmadinejad was a leader in the 1979 U.S. Embassy siege as some former hostages have said. Several of the Americans who were held said they recognized the ultraconservative Tehran mayor -- who was elected president in a landslide on Friday -- as a ringleader in the hostage-taking. However, two leading figures in the embassy seizure said he did not take part. "I have no information," Bush told reporters during a briefing on the upcoming G8 summit in Scotland. "But obviously his involvement raises many questions, and knowing how active people are at finding answers to questions, I'm confident they will be found." Bush also issued a warning to Ahmadinejad, 48, that he and European leaders would send a "strong message" to him about their concerns over Iran's nuclear ambitions. In the 1979-1981 hostage crisis that led Washington to break ties with Tehran, 52 Americans were held for 444 days. Bush has branded Iran as part of an "axis of evil" for allegedly pursuing nuclear arms and sponsoring terrorism. Iran denies the charges. 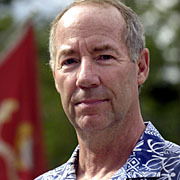 In interviews with U.S. television networks, retired Navy Capt. Donald Sharer and Bill Daugherty said they were convinced Ahmadinejad was one of their Iranian captors. "He wasn't a very nice fellow at the time. He called us pigs and dogs. He's very hard-line, he's a guy we are not going to get along with," said Sharer in an interview with ABC's "Good Morning America" show. Daugherty said he had "no doubts at all" that Ahmadinejad was one of his hostage-takers. "When your country is being humiliated and being embarrassed, the individuals that do that really stick in your mind. You don't forget people who do things like that to you and your family and your country," Daugherty said. In Iran, Abbas Abdi, who helped to orchestrate the raid, said Ahmadinejad "was not among those who occupied the American Embassy after the revolution." Mohsen Mirdamadi, another ringleader, said: "I deny such reports. Ahmadinejad was not a member of the radical students' group who seized the embassy." Since his victory, U.S. officials have said little publicly about Ahmadinejad, though they have criticized the election itself as flawed and unfair. Bush said he had spoken to British Prime Minister Tony Blair and German Chancellor Gerhard Schroeder about efforts to prevent Iran from pursuing nuclear arms, and he said he would also be speaking to French President Jacques Chirac. "My message is that it's very important at this moment for the EU-3 to send a strong message to the new person (in Iran), that the world is united in saying that you should not be given the capabilities of enriching uranium which could then be converted into a nuclear weapon," Bush said. "In other words, we've got a new man who's assumed power, and he must hear a focused message," he added. The United States accuses Iran of seeking to develop nuclear weapons but the country's leaders insist they want to produce nuclear energy for purely peaceful purposes.